There are two major non-cancer types of chronic pain – musculoskeletal (MSK) pain related to bones, joints, ligaments, tendons, and muscles and neuropathic pain often felt as a burning sensation or shooting pain caused by nerve or tissue damage. Pain is considered chronic if it lasts for three months or more. 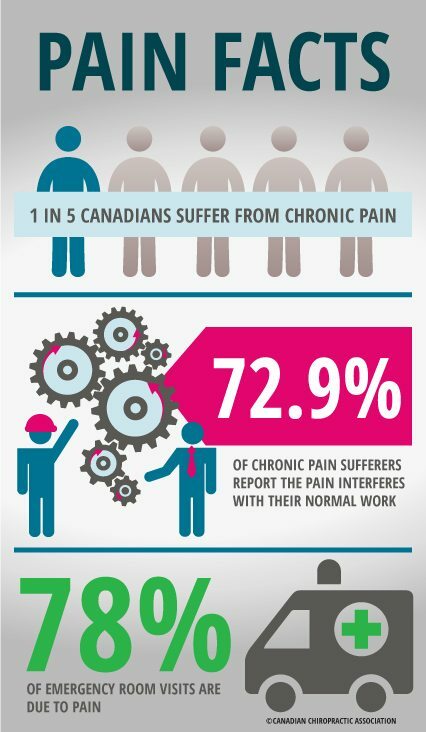 In a 2011 study from Queen’s University, when asked the simple question, “Are you usually free of pain or discomfort?” 55% of the Canadian population reported to suffer non-specific chronic pain. Most of these patients report pain in their back, joints or head, whether from MSK conditions or other underlying conditions. Pain in these areas may be caused by a trauma or a physical event, like a car accident or a slip and fall, but most often the pain presents as non-specific or without a known underlying cause. However, there are numerous underlying structural or mechanical causes that can be addressed through conservative care. Identifying a cause of chronic pain can be difficult, but chiropractic expertise in the assessment and diagnosis of MSK disorders can help pinpoint the origins of pain. Commonly, chronic pain can be caused by underlying conditions, such as spinal stenosis (narrowing in the spinal canal which may result in nerve compression), osteoarthritis (joint pain and inflammation) or inflammatory arthritis. Chiropractors are trained to assess and diagnose MSK conditions and suggest an individualized treatment plan, or referral as appropriate, that may include spinal manipulation or mobilization, traction, ultrasound and other therapies to alleviate pain, as well as lifestyle counselling and exercises to strengthen the core muscles that support the spine. Other common forms of chronic or recurrent pain can manifest in the form of headaches. In fact, headaches can be debilitating and considered chronic if you experience three in a row. Headaches can be caused by numerous factors including nutritional or environmental triggers, referred from the cervical spine or associated musculature, or even stress. Chiropractors, as part of your healthcare team, can assess and help identify potential sources of pain. Depending on the exam findings, chiropractic treatment can address underlying causes such as joint dysfunction or muscular tension, or provide nutritional advice to help alleviate symptoms or decrease frequency. It is not uncommon for those suffering from a chronic condition to also suffer from other comorbid conditions. The relationship between pain and insomnia, depression or mood disorders is not well understood; however, co-management from a team of healthcare providers may be needed to better address the needs of the patient. Chiropractors will partner with family physicians and other providers to effectively treat patients experiencing pain and associated comorbidities. The good news for chronic pain sufferers is that there is care available. Conservative care, including chiropractic, can help to alleviate acute and chronic symptoms as well as correct underlying mechanical dysfunctions and recommend exercises to keep the body moving. One such program for chronic pain management was developed by Dr. Carlo Ammendolia, DC, PhD, at the University of Toronto and Mount Sinai Hospital. Dr. Ammendolia’s evidence-based boot camp program helps spinal stenosis patients by providing strategies for self-management, decreasing pain and increasing function through guided exercise and manual therapy. Patients who have attended the boot camp report increased mobility, reduced pain and a greater quality of life. Such interventions are also valuable for other MSK-pain sufferers. A 2012 U.S. study has revealed that patients receiving chiropractic treatment combined with exercise for chronic neck pain were twice as likely to become pain-free than those receiving medication. The study followed 272 neck-pain patients for 12 weeks. The patients were randomly assigned to one of three groups: 91 to the spinal manipulation therapy group, 90 to the medication group and 91 to the home exercise group. Chiropractic care as part of the healthcare team can play an important role in the assessment and management of chronic pain related to MSK conditions. More and more studies are providing evidence of effective relief of chronic pain through chiropractic treatment. Click here to find a chiropractor near you.